Swift Glass is excited to announce that we’ll once again be attending the annual SPIE Photonics West Conference and Exhibition, at the Moscone Center in San Francisco from January 28 to February 2. Hosted by the International Society for Optical Engineering (SPIE), Photonics West has been the world’s largest multidisciplinary event for biomedical and medical photonic technologies for over two decades. Attended by over 20,000 people, this exhibition draws industry leaders from across the country to view new technologies, hear educational speakers, and network with others in the field. State-of-the-art medical devices and systems, the Internet of things, smart manufacturing and “Industry 4.0” autonomous vehicles, communications equipment, new scientific research, and various displays will all be on view at the photonics exhibition. Attendees will have the chance to go to technical and networking events, as well as professional development seminars and student events. Various workshops will also be offered, with topics including laser applications, optomechanics, semiconductor lasers and LEDs, and biomedical spectroscopy, miscopy, and imaging. We’ll be set up in Booth #608, displaying various types of display glass, as well as large chemically strengthened rectangular glass and other samples of our chemically strengthened glass. We’re looking forward to speaking with other optics conference attendees and showcasing our unique product line. We hope to see you there! As an ISO-certified and ITAR-registered company, Swift Glass is committed to quality in everything we do. Our custom glass manufacturing capabilities include chemical strengthening, waterjet cutting, edge grinding, thermal tempering, surface lapping, CNC machining, polishing, drilling, and optical glass fabrication. To learn more about this exciting glass manufacturing conference, reach out to us today. And, for more information about our diverse service offerings, visit our website. Glass is among the world’s most sophisticated materials. Specialty glass can withstand high pressure, extreme heat, and extraordinary environments. There are two primary methods for strengthening glass: chemical strengthening and thermal tempering. Both of these processes alter the outer surface of the glass, causing it to have a higher compression than the interior glass, which is in a state of tension. Depending upon the specific application, each process offers unique advantages for a material’s final makeup. Also known as ion exchange, chemical strengthening treats glass by submerging it in a molten potassium salt bath, causing sodium ions in the glass to be replaced by potassium ions from the bath. The potassium ions, which are larger than the sodium ions, squeeze themselves into the gaps left by the smaller sodium ions when migrating to the potassium solution. The surface of the glass is then in a state of compression while the core is in compensating tension. The chemical composition of the bath can vary widely, allowing this process to be tailored to the material’s final application. Chemical strengthening can create a high-performance glass with no notable distortion and a very shallow surface layer of strengthened, alkali-rich material. The added strength of this specialized glass makes it ideal not only for harsh environments but also for high-performance applications in conductors, semiconductors, energy, medicine, and more. Chemical Strengthening can be performed on much thinner glass than heat tempering. Tempered glass undergoes an intense heating process immediately followed by rapid cooling. This extreme temperature shift causes the glass surface and edges to compress, creating an extremely tough outer surface with a tensioned glass core. From aviation and aerospace to laboratories and industry to household items and fire safety, both chemically strengthened and thermally tempered glass offer countless solutions to daily safety and environmental challenges. No matter the size or demands of your project, Swift Glass can help. Our specialists offer ultra-high pressure cold cutting, CNC machining, polishing, drilling, printing, and a host of other manufacturing capabilities to support both our chemical strengthening and thermal tempering services. To learn more about high-performance glass that can withstand even the most difficult circumstances, download our new eBook, Creating Glass That Withstands Extreme Environments, or reach out to us today! When choosing between glass and plastic for an application, many people with cost-conscious applications expect plastics to be the cost-effective choice. But you just may have more options than you think. In the long term, plastic can actually accrue higher costs in maintenance, replacements, and repair work. Both materials offer specialized benefits in a wide range of applications, but the perks of glass offer long-term benefits and unexpected savings. Glass promises superior overall performance when compared to plastic: better transmittance, improved insulation, and high scratch resistance are just the beginning. Customers choose glass for its high-end aesthetics, weather and chemical resistance, and low expansion and contraction in extreme temperatures. But it’s more than just a higher level of performance — glass offers durability, meaning lower costs for maintenance. Less frequent repairs and replacements also mean less cost in the long-term, not to mention less stress. The Swift Glass team stands ready to help every customer find the best glass material fit — and still save money. We focus on procuring the ideal material investment for a project, and we’re proud to maintain a vast inventory of glass variations to suit any project, performance challenge, or price point. 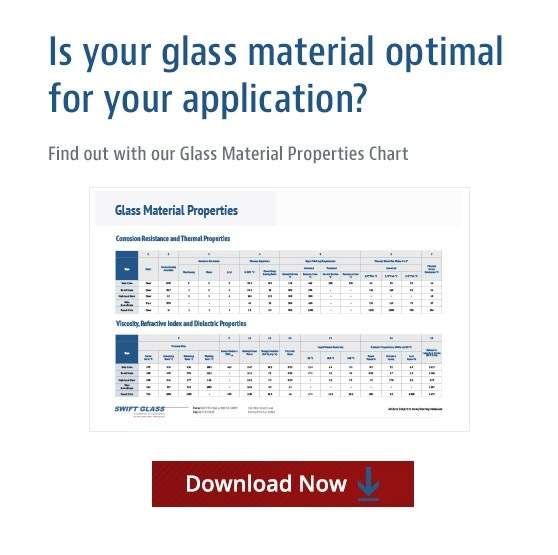 Learn more about what affects the price of your glass parts with our new eBook, or contact us today! What Makes Borofloat® Glass So Special? Borofloat® glass is one of the world’s most influential specialty glass materials, able to meet a huge range of the most technologically challenging applications. Jobs that require extreme temperature and fluctuation in that operating temperature. Because of its low coefficientof thermal expansion, Borofloat® is the best choice for such applications. Our glass can even operate in conditions where temperature is very different from the center of the glass to the outside edges. Photonics, optics and opto-electronics. Borofloat® glass also has extremely high transparency in the near-infrared and ultraviolet ranges. In addition, our glass does not distort light as it passes through the lens. Equipment in the biomedical and analytical industries. High resistance to acids and alkalis, not to mention organic substances is another great feature of Borofloat® glass. Without resistance to these substances, damage to a lens could result in faulty readings from the equipment. Inspection panels for high pressure or heavy load applications. A lens made of Borofloat® glass is resistant to scratches and abrasions. When an application requires heavy loads, or high pressure, this becomes critical. In addition, the strength of Borofloat® means that you don’t have to worry about damage to a critical component. This strength allows it to be used as an inspection panel without concerns of breakage during use. High- Performance Lamps –Borofloat® has been used in cinema projectors and theater lights, not to mention other powerful types of lighting equipment. Oven Windows – Capable of handling temperatures up to 450 degrees Celsius, Borofloat® can be used in ovens without fear that the glass will be damaged by the high heat. Laser Optics – Borofloat® lenses are ideal for applications such as lasers, allowing as much of the light spectrum to pass through it as possible. Whatever heavy-duty applications you need glass to work with, Swift Glass can provide you with exactly what you need. To learn more about Borofloat®, watch the video below. You can also contact Swift Glass today to see how we can help you with your industrial glass needs.